The North Eastern Ontario Rail Network (NEORN) held a summit regarding the renewal of passenger rail service in Ontario, and how to make it happen. 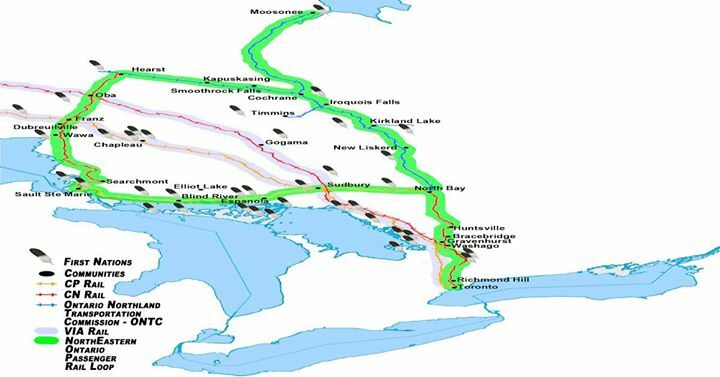 The goal was to address the socio-economic, tourism, and cultural benefits of renewing the entire rail loop on existing rail beds in Northeastern Ontario, from Moosonee to Toronto, servicing all the communities in between. Key stakeholders include representatives from First Nations, municipalities, post-secondary institutions, healthcare organizations, organizations for people who have disabilities, businesses, tourism organizations, environmental organizations, rail advocates, provincial and federal officials, and politicians. Kara Flannigan also stated that passenger rail service is a Green Party priority. MPP Ross Romano says he will do what it takes to keep this a priority at Queen's Park. Stakeholders unite in the fight to support the tourism industry and the economic in the unique and rugged north. Jane Krajc, Unifor Local 103, shares insight into job development and her experience working on a train in North Bay. Heather Bot, from Algoma Country, shares some of the missed marketing and tourism development opportunities as a result of the ACR cancellation in 2014. Rod Raycroft discusses the tourism benefits on behalf of Tourism Northern Ontario. Stakeholders take part in the day's forum and panel discussion. Al Errington, rail advocate and owner/operator of Errington's Wilderness Island, shares the details of an optimized Sault to Hearst train schedule. People came from across Ontario to take part. Patricia Ann Owl, from the Ontario First Nations Economic Developers Association, highlights the opportunities for First Nations. (Left to right) Dean Anderson, Al Errington, Lucille Frith, Ken Bitten, Linda Savory-Gordon, Sylvain Gervais, Corina Moore, Bruce Budd. All shared their insight within their professions as they relate to this issue. For those of you who may not know, rail service in Canada – and specifically in Ontario – has been rapidly deteriorating for years. The Sault to Hearst Algoma Central Railway service was cancelled when Transport Canada cut the $2.4 million dollar subsidy that funded the CN line. Groups such as CAPT (Coalition for Algoma Passenger Trains), CPMRT (Coalition Promoting Muskoka Rail Travel), NEORN (North Eastern Ontario Rail Network), and the Missanabie Cree First Nation – amongst others who desperately want to see the train running – have been fighting an uphill battle ever since. I can say from my firsthand experience working as the First Nations and Stakeholder Engagement Coordinator for the Missanabie Cree First Nation, hand in hand with Chief Jason Gauthier on this project, that progress ebbs and flows. One minute, it seems as though negotiations are moving forward, progressing positively with CN and Transport Canada, and the next minute, it feel as though the north is being shunted to the side over in Ottawa. Right now, the initiative is at a plateau, making this rail summit the perfect launch into the upcoming provincial elections, and an opportunity for rail professionals and local stakeholders to network and build upon meaningful partnerships that have been developing throughout Ontario. “It isn’t just about economic development for the First Nation, it’s about economic development for the entire province,” said Chief Gauthier when addressing the audience. The full horseshoe map of existing rail beds in Ontario which could be utilized to provide passenger train service, servicing both Northern and Southern Ontario and connecting the regions in between. And that is just one portion of the larger puzzle. Lucille Frith, spokesperson for CPMRT and NEORN, shares the situation east of the Sault. In 2012, the provincial government diverted all funding for ONTC (Ontario Northland Transportation Commission), which shut down the rails in North Eastern Ontario, hugely affected Muskoka and surrounding municipalities. No investment in public transportation had been made north of Barrie since 2012. This year, the provincial government announced funding which will support infrastructure upgrades and bus service. (More information on that can be found here and here). However, preference for this mode of transportation or that aside, there are groups and individuals who cannot travel by bus. Jane Krajc, Vice President of UNIFOR Local 2013 shared, “When I worked on the train, one New Years Eve, we met with travellers at a station who couldn’t finish their journey via car because the roads were closed. Having gotten to know wonderful souls like Dorothy McNaughton, who has a visual impairment and who advocates on behalf of those with vision loss, I can second what Krajc stated. For some people, it isn’t a matter of mere preference, train or car. It is their only method of travel whereby they can go freely and independently. Krajc also announced that Unifor Local 103 supports the reinstatement of passenger rail service, as it would promote job creation in supply chain and tourism industries. Economic investments in the Sault are desperately needed. Operators along the rail line have experienced an 80% loss since the train stopped. This is the result of missed marketing opportunities, the stakeholders argue. Algoma Country representative Heather Bot explained that Northern Ontario is the number one fishing destination in Canada for the American market. Renowned Art historian Michael Burtch shared how critical the train was his Group of Seven research and filming the documentary ‘The Painted Land’ with Gary and Joanie McGuffin. How do we grow that economy without proper transportation? The arguments have been presented to the federal and provincial government a number of times, and prior to the summit, local, provincial, and federal politicians and members of parliament were sent questions about how their party platform plans to address the transportation issues in Ontario. (The full list can be found here). Politicians who showed up to show support, answer questions, and collect information to bring back to the respective parties include MPP (Sault Ste. Marie) Ross Romano of the PC Party, Kara Flannigan of the Green Party, and MPP (Algoma-Manitoulin) Michael Mantha of the NDP Party. Flannigan reiterated the Green Party’s support for rail. Romano confirmed that the PC party is intending to proceed with the Toronto to Cochrane route within the first mandate, with intention to look into the feasibility and viability of renewing other routes. Sault Ste. Marie Mayor Christian Provenzano and Hearst Mayor Roger Sigouin also attended the event. Both have openly expressed formal support for the renewal of rail service. Representatives from CFS (Canadian Federation of Students) were also present, who have sent in letters of support and resolution for the renewal of passenger train service. Special guest speakers included Corina Moore, CEO of Ontario Northland, Bruce Budd, President of Transport Action Canada, Ken Bitten, retired Director of Passenger Services at Iowa-Pacific, and Sylvain Gervais, Director of Operations and Maintenance (Canada contract) at Bombardier Transport. For more information on NEORN and future town halls which will be taking place across the Algoma region, click here.